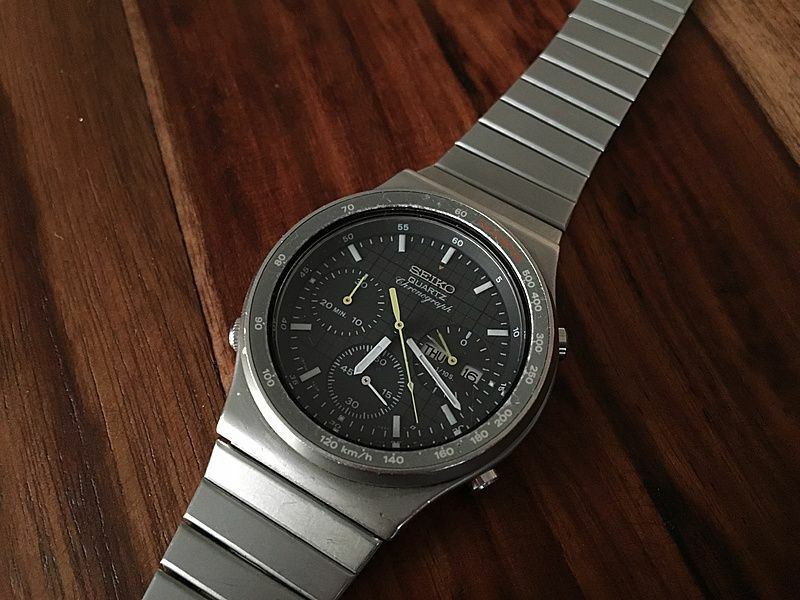 Perhaps it was the fact that Hung's 7A38-701A was obviously used, but still in nice well-cared-for condition that set my expectations. Because most others I saw - on eBay or anywhere else, over the next couple of years were, by comparison, rather sadly lacking. 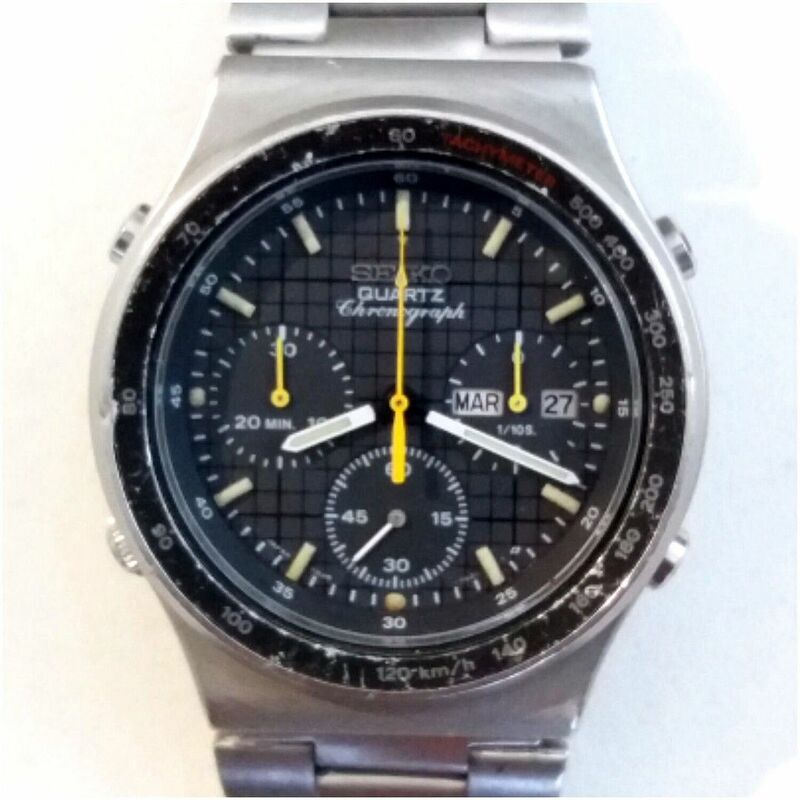 The most common malaises were graunched bezel inlays, badly faded chrono' hands and incorrect replacement bracelets fitted. 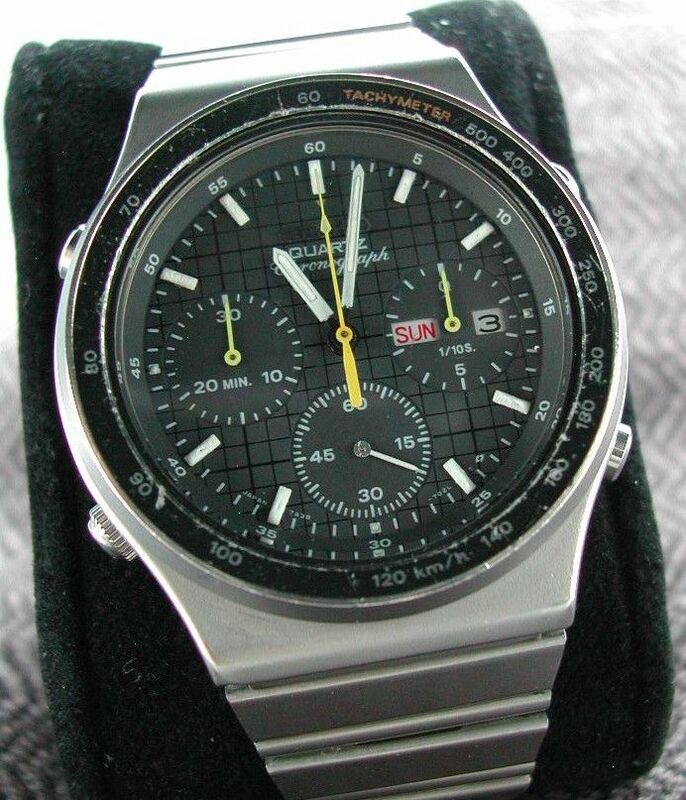 Typical was this one, which was the next set of photos I saved from a thread on the old Network 54 SCWF back in March 2009. 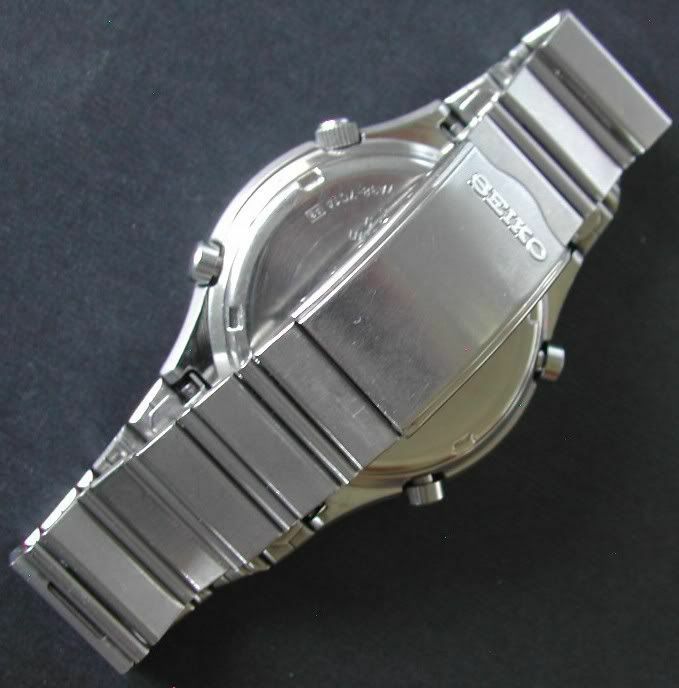 Just discernable from the above photo, the incorrect replacement bracelet fitted is a somewhat knackered Seiko p/n YA16A, as would originally have been fitted on a JDM 7A28-7010, but without its Speedmaster logo'd clasp. 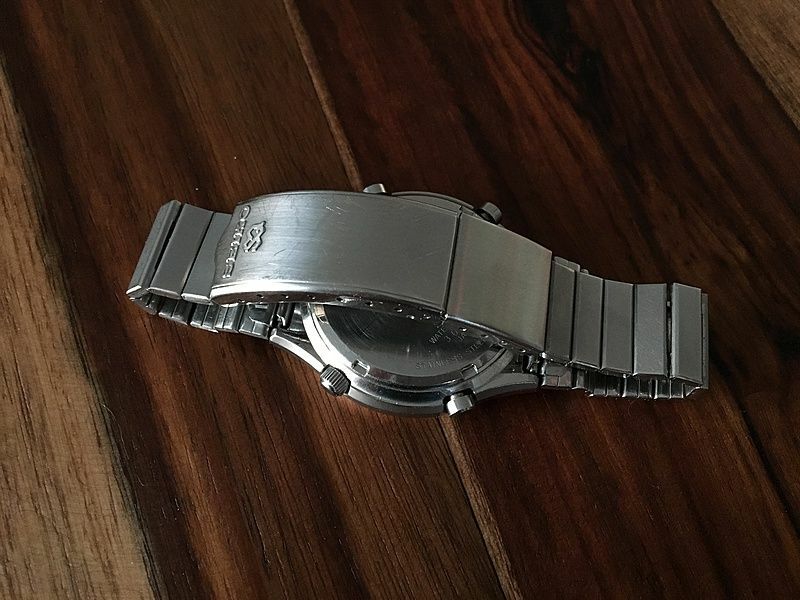 These two photos came from another old SCWF thread around the same time and may have been a subsequent FS post - by 'Glen'. 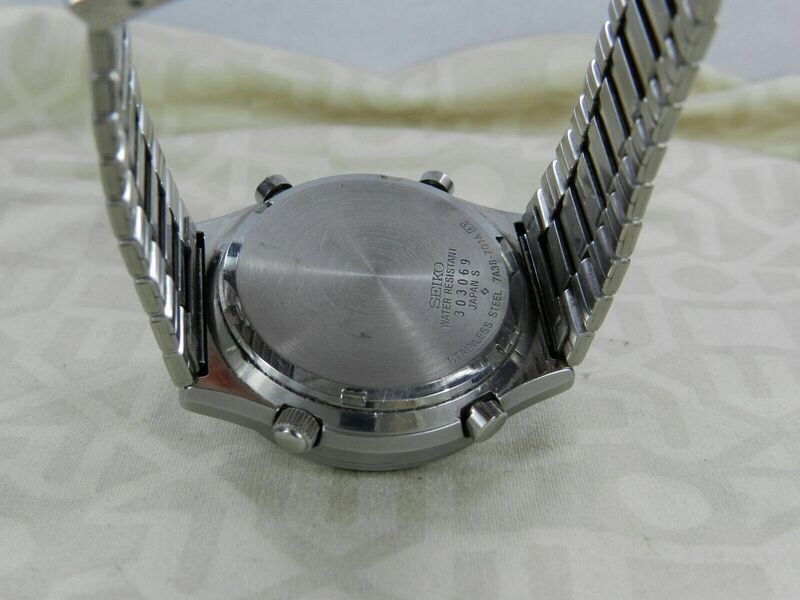 Some watches are instantly recognisable from their patina (and discrepancies) - even after 7 years. 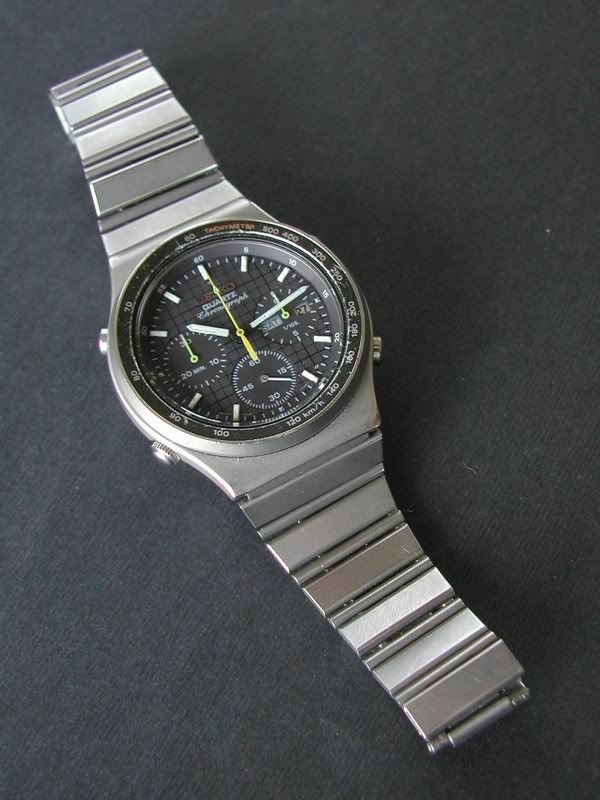 I'd first seen the above photos of this 7A38-701A posted on the old Network54 SCWF, as far back as March 2009. 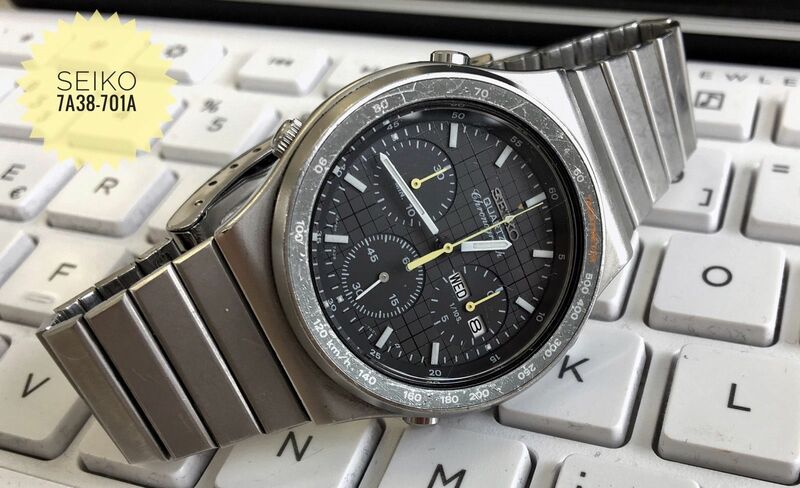 I can't remember who the original poster was, nor have I been able to find the two threads the photos came from, but the same 7A38-701A fitted with a non-original Seiko p/n YA16A bracelet was advertised FS on SCWF yesterday. 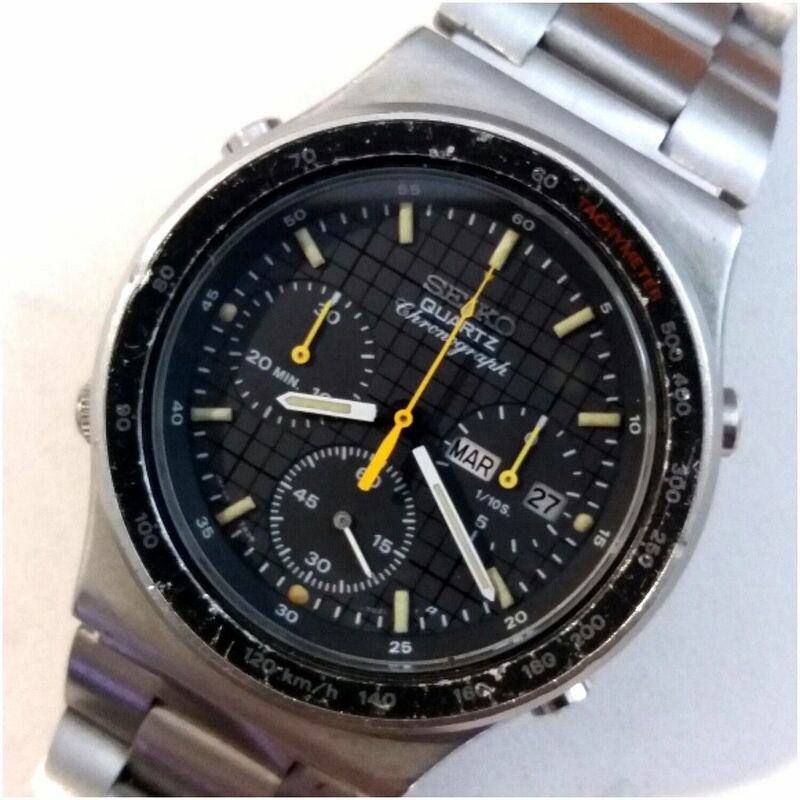 Probably one best avoided unless you're looking for an original bracelet - it appears to be fitted with the correct Seiko p/n Z1118S. 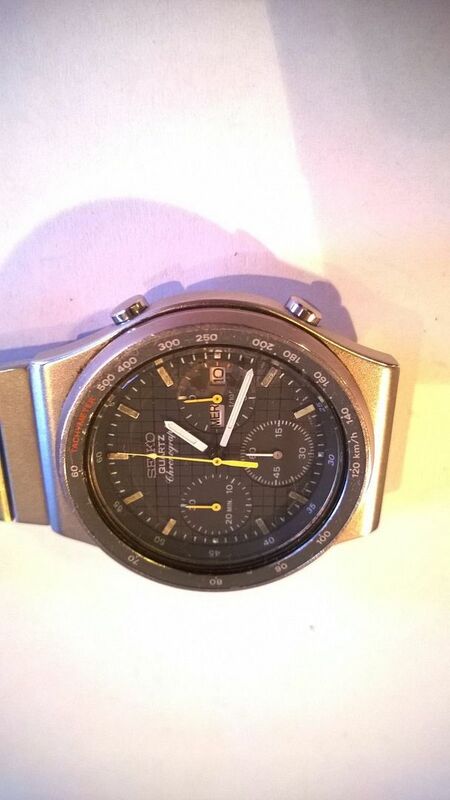 The above eBay auction for a 7A38-701A 'Project' ended about half an hour ago, making 112 Euros (approx. 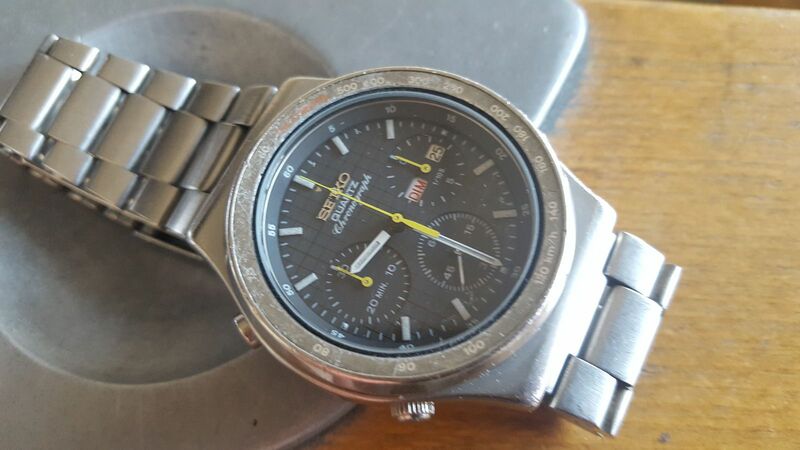 £88.65) after 17 bids. 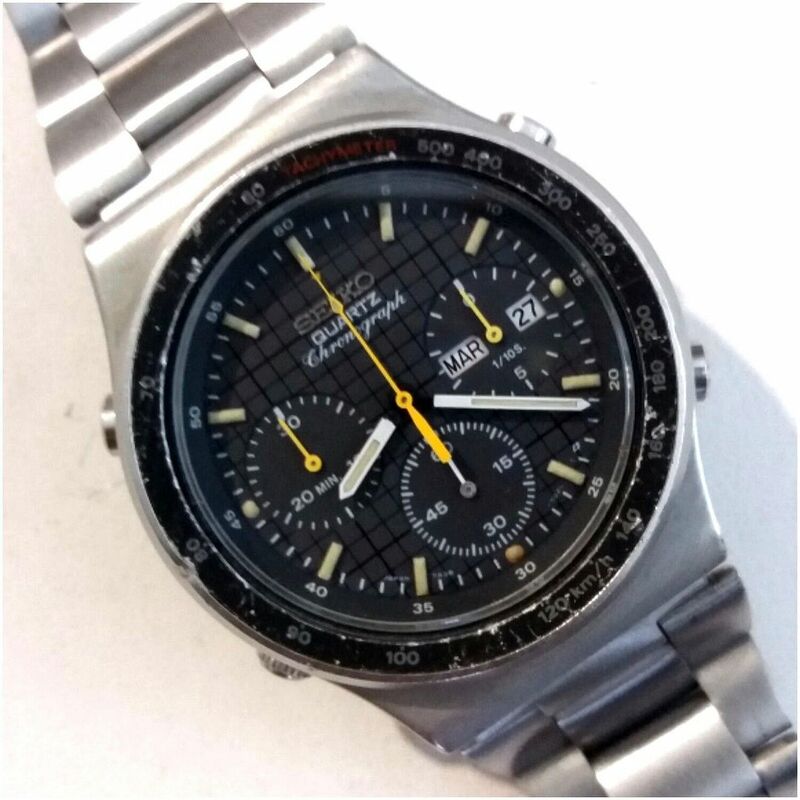 As we don't see too many of these, I thought I ought to mention this 7A38-701A, which sold on eBay Germany earlier this week. 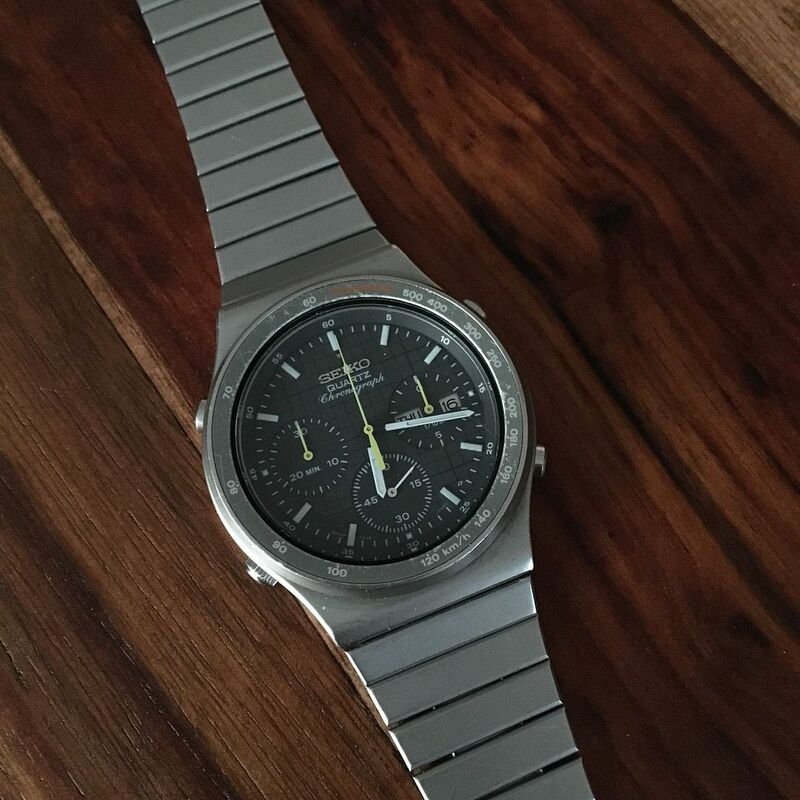 I didn't see the listing while it was briefly live, but picked it up from an eBay search on ended listings. 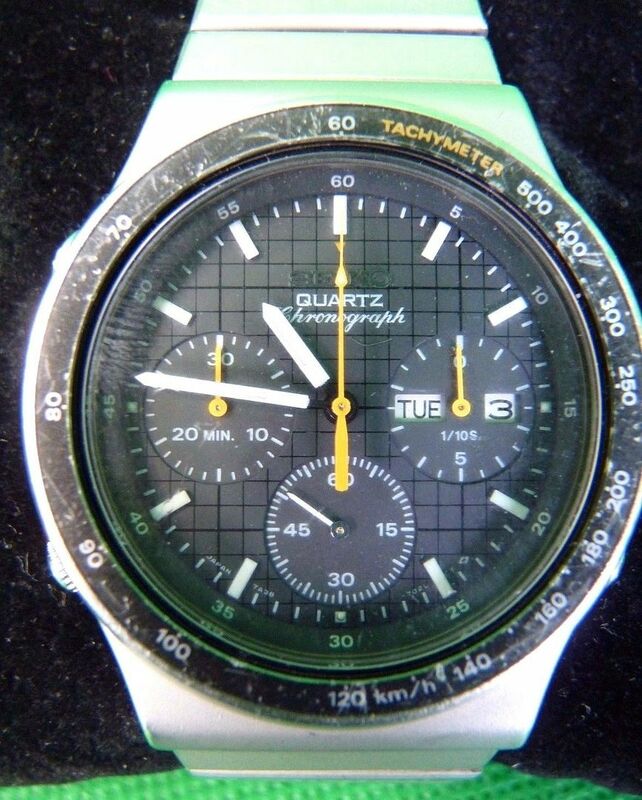 Generally appeared to be in half-decent average worn condition, apart from the usual scratches to the bezel inlay. 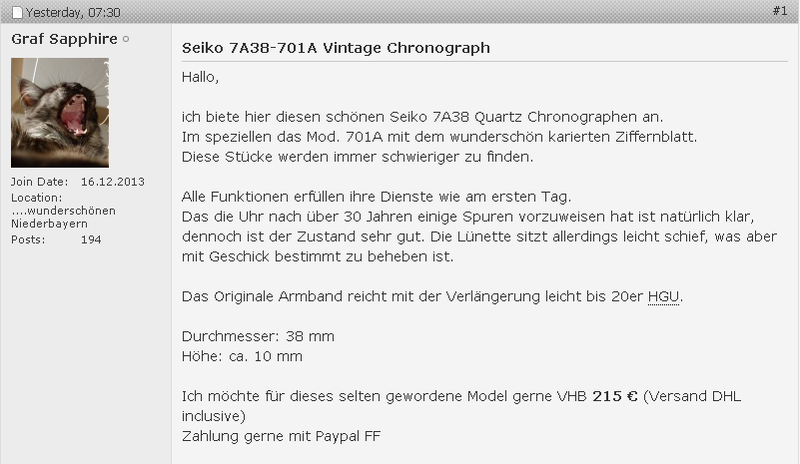 The description was a complete nonsense, because the seller had created this listing by cloning his other current one for a two-tone 7A38-7020 (item # 262657602204 - now also sold). 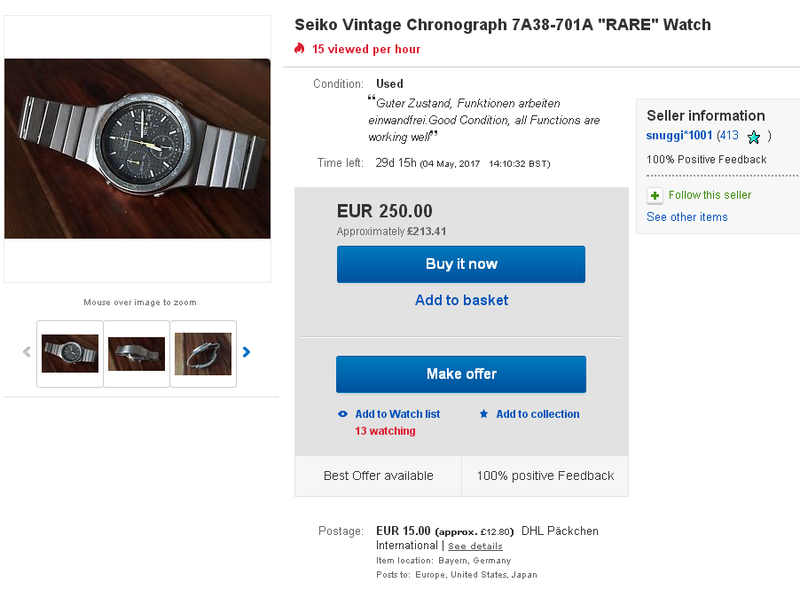 Although Goofbid's eBay Best Offer History tool shows that the seller received and declined two 'lowball' offers of around 90 Euros, it doesn't show what it actually sold for, so one can only presume that someone else paid the 179 Euros Buy-it-Now price. 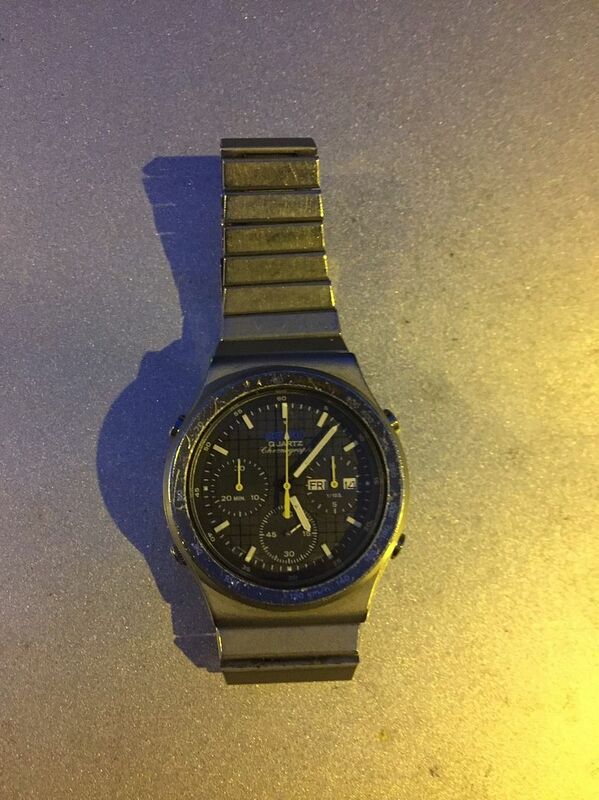 This well-worn looking (best one can tell from the single dingy photo) example of a 7A38-701A was listed earlier today, by the same Italian eBay seller who listed a 7A38-714A a couple of days ago. 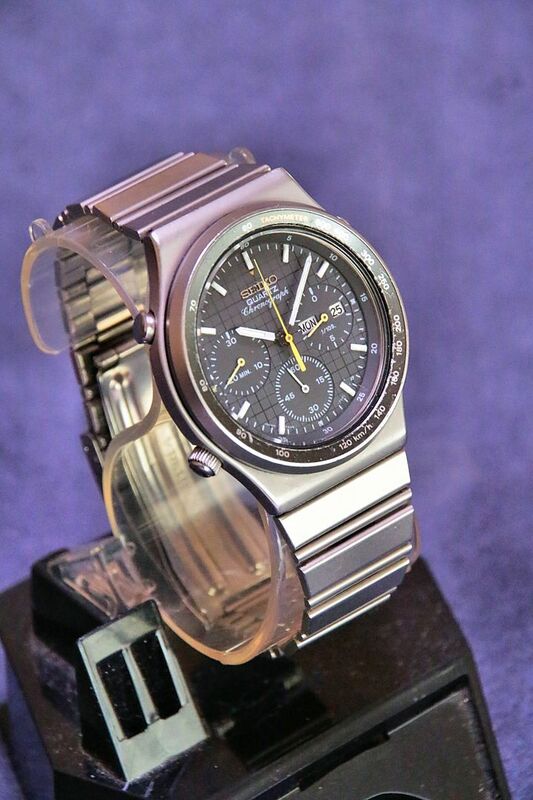 Orologio Seiko Ref 7A38-701A chronograph al quarzo funzionante in acciaio orologio originale vissuto come da foto. 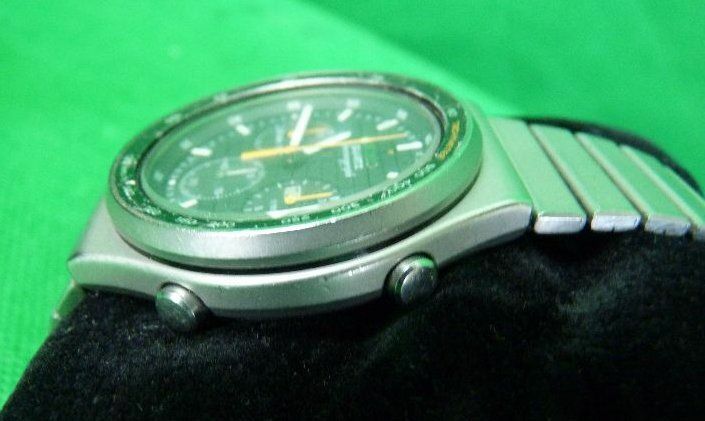 The above 10-day eBay listing for a well-worn 7A38-701A by an Italian seller ended ended earlier this morning. 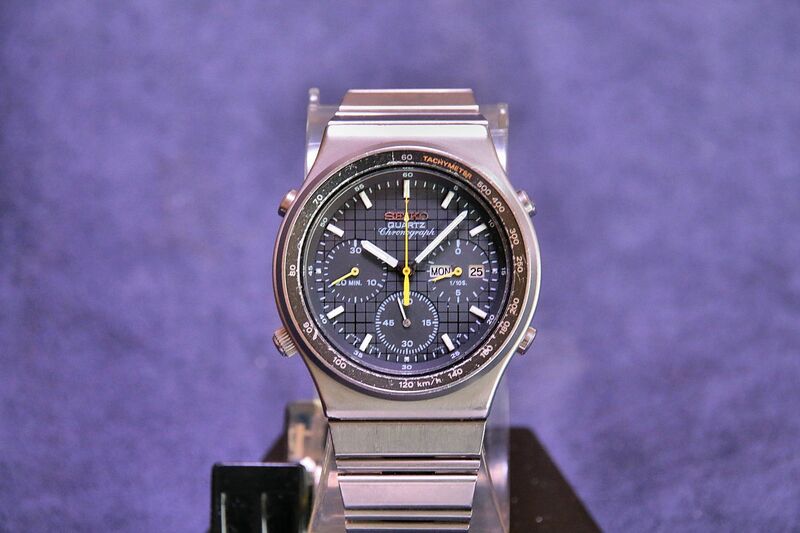 Despite having 15 watchers, it went unsold. 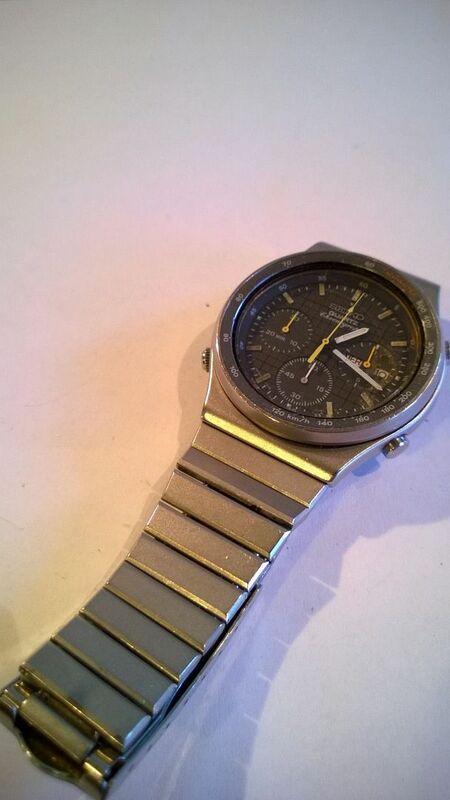 Here's another 7A38-701A that was listed yesterday by a French eBay seller, with an opening bid price of 1 Euro - a rather battered looking example fitted with an unidentified non-original replacement Seiko bracelet. 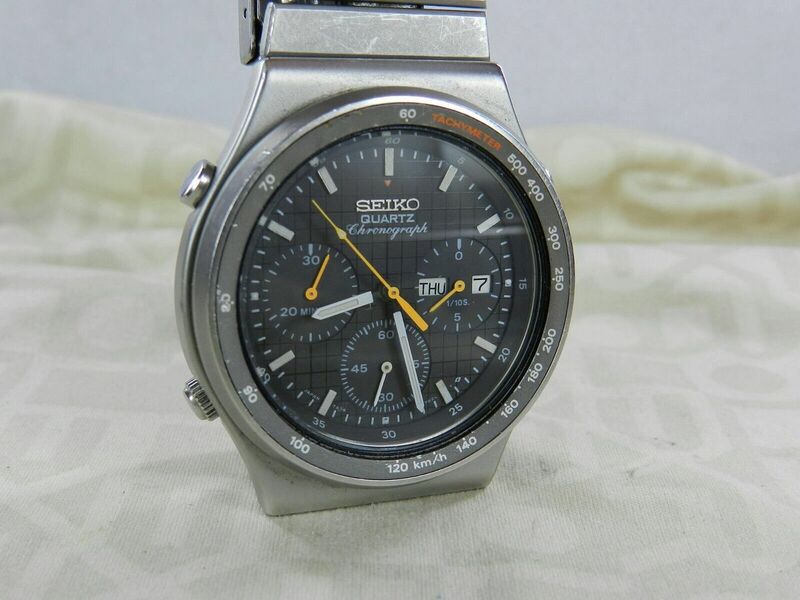 Jolie montre Seiko modèle 7A38 - 701A en bon état, seule la lunette présente des rayures. 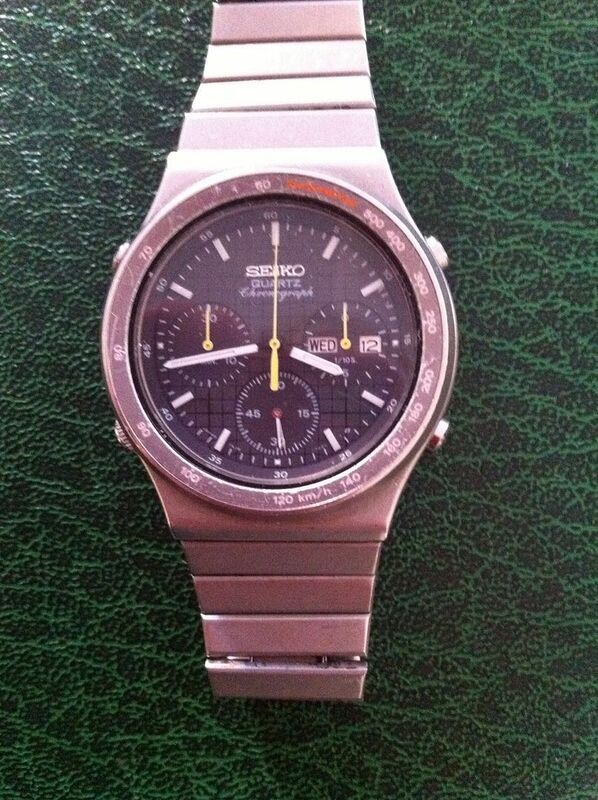 Toutes les fonctions sont ok.
Nice vintage Seiko 7A38-701A in good condition, only the bezel have scratches. All functions are ok.
for your country, tell me before bidding. 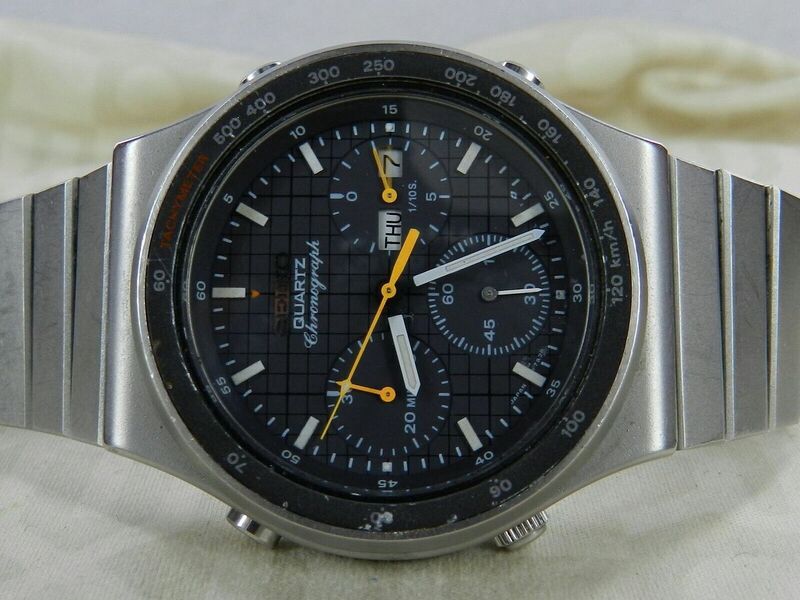 That 7A38-701A offered by the Italian eBay seller is back again - re-listed, with a slightly better photo this time. But still only the one. 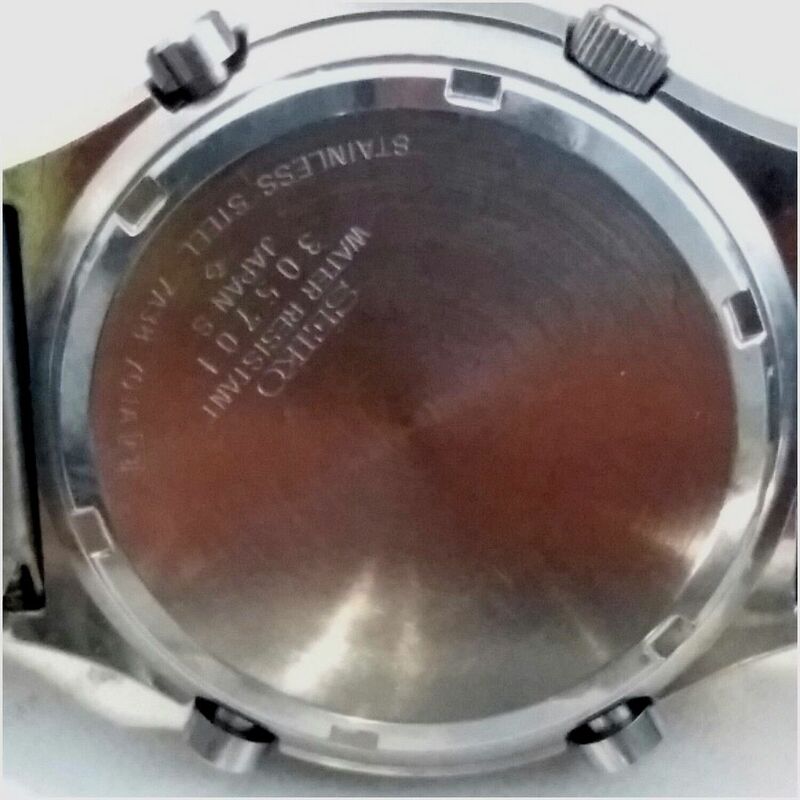 The above re-listing for a 7A38-701A by Italian eBay seller molisht77 ended this morning - with a somewhat inconclusive result. 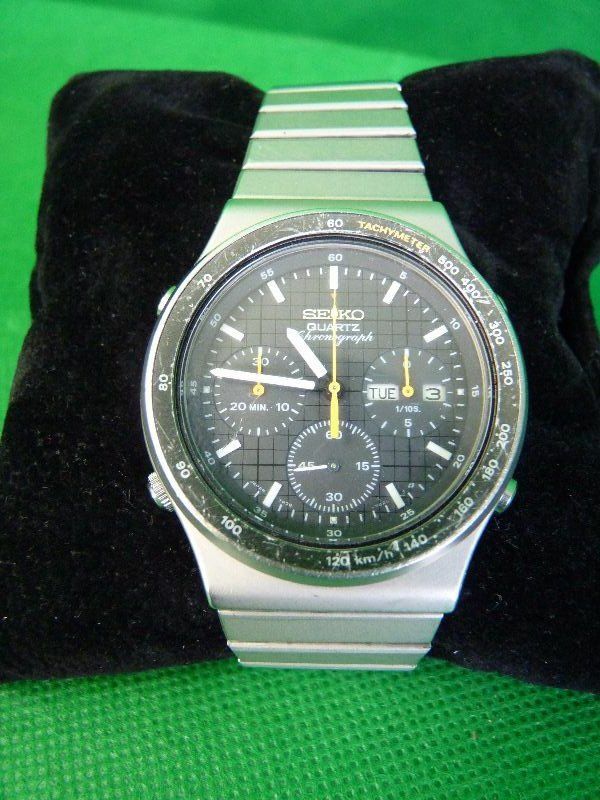 .... whereas the eBay.com search on ended listings result shows it sold against a Best Offer accepted. Annoyingly, once again Goofbid's eBay Best Offer History tool failed to pick up the amount it actually sold for - just showing two declined lowball offers (one of which was against the previous listing). 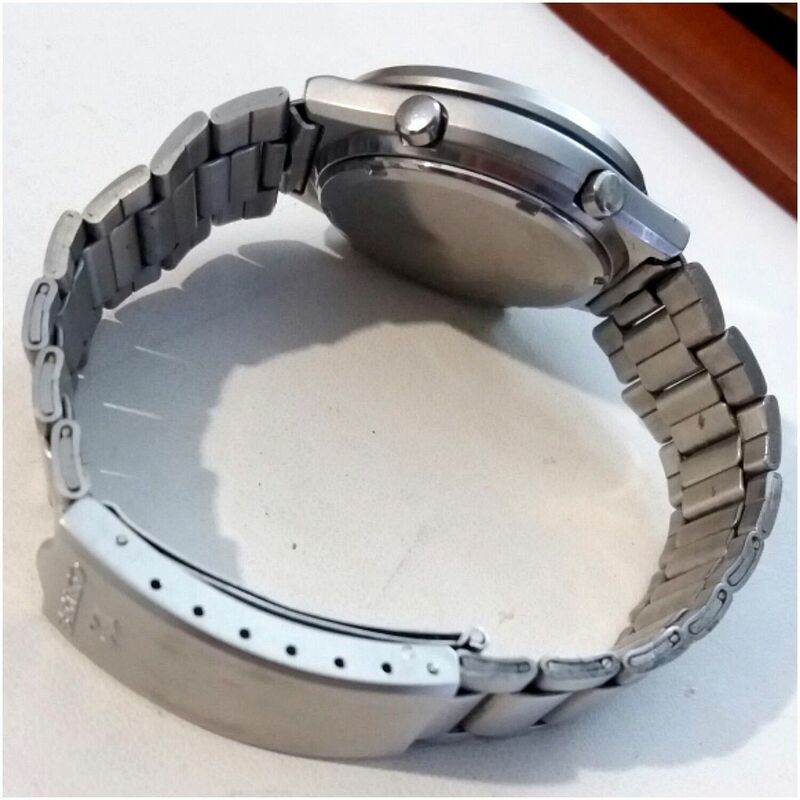 My frustration at no longer being able to rely on Goofbid's tool to discover what an eBay item actually sold for (against a Best Offer) led me to seek out an alternative solution - or workaround. Which I did. See this thread in the Member's Lounge section. 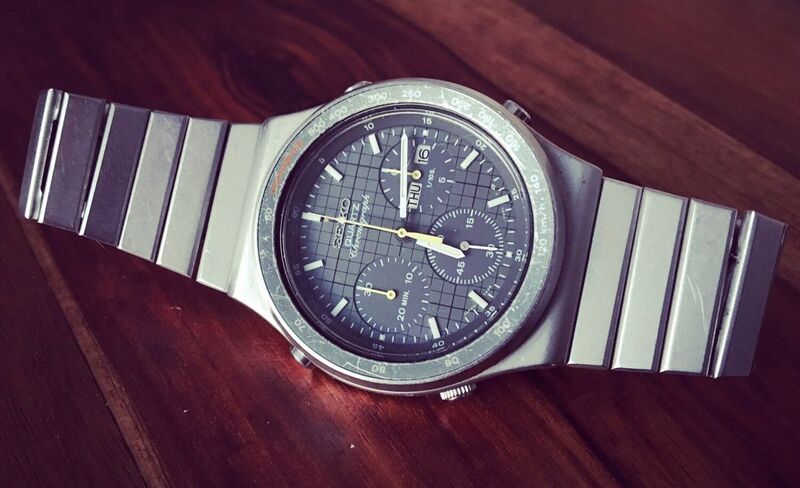 I can now confidently state that according to eBay this 7A38-701A actually sold for a Best Offer of 160 Euros NOT 200 Euros. 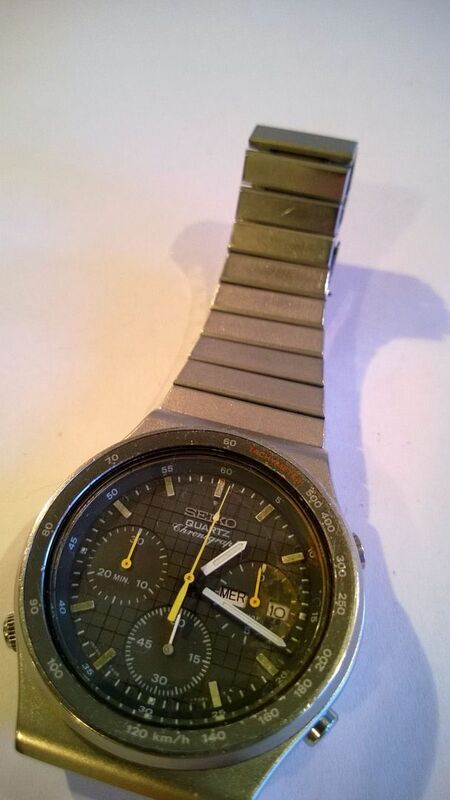 That French eBay listing for the tatty 7A38-701A fitted with a non-original Seiko bracelet ended a few moments ago, selling for a quite astonishing (given the poor condition) 171 Euros (approx. 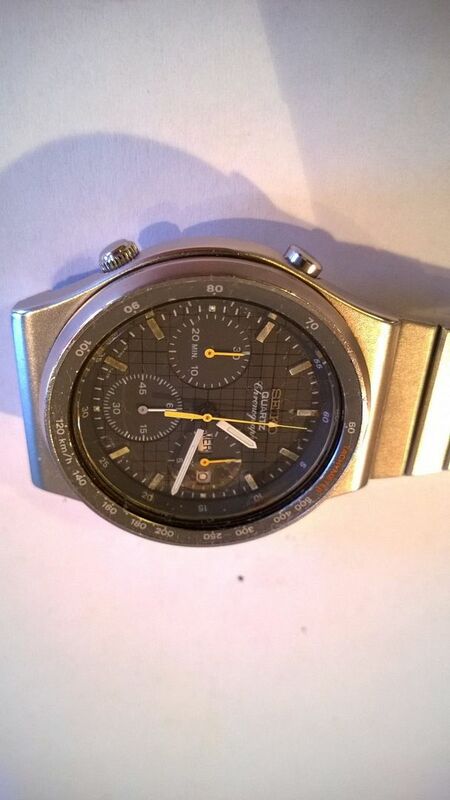 £146) after 31 bids. 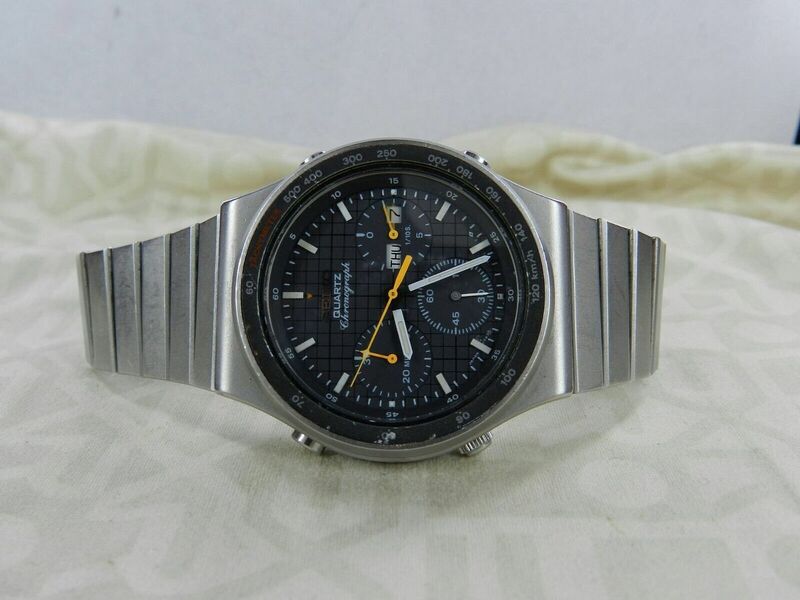 .... And no great surprise (to me) has 100% bidding activity on this seller's item - clearly indicating a shill. 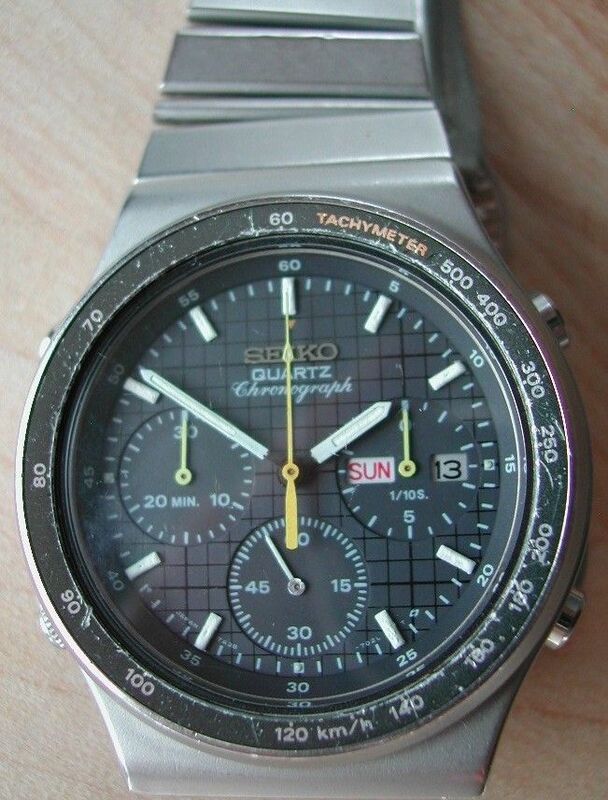 This average worn condition 7A38-701A was listed yesterday evening by an Italian eBay seller, with an opening bid price of 1 Euro and a title of simply Seiko 7a38. 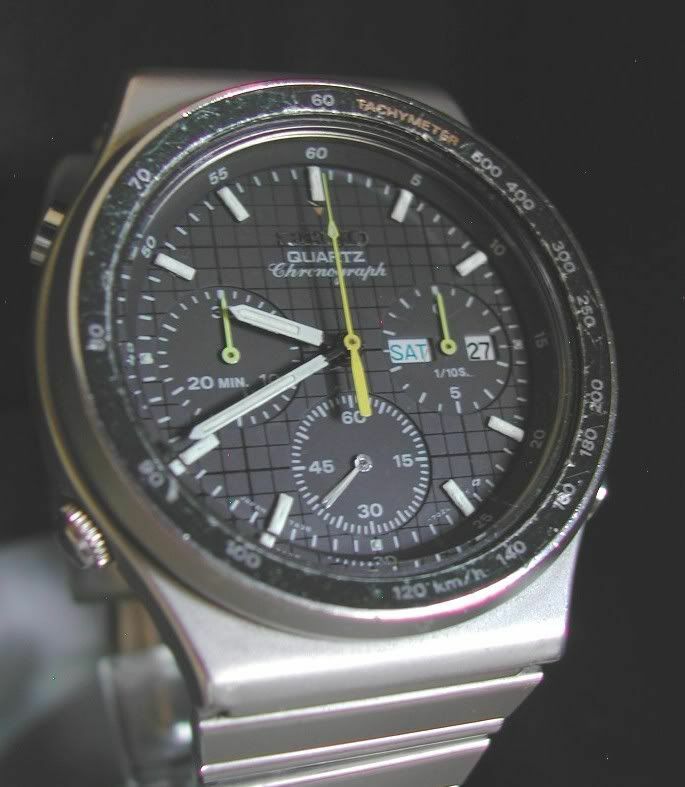 Whereas far from being pristine, the bezel inlay on this example is better than most examples, with only one significant mark on the Tachymeter scale, right on 80. 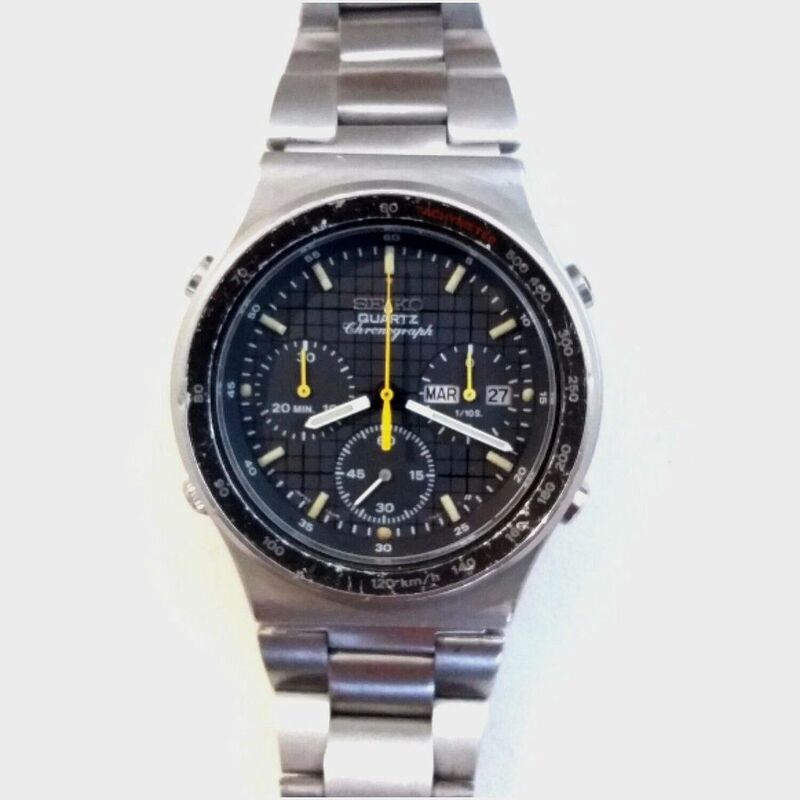 Unusually, the chronograph hands retain their original bright orange colour. 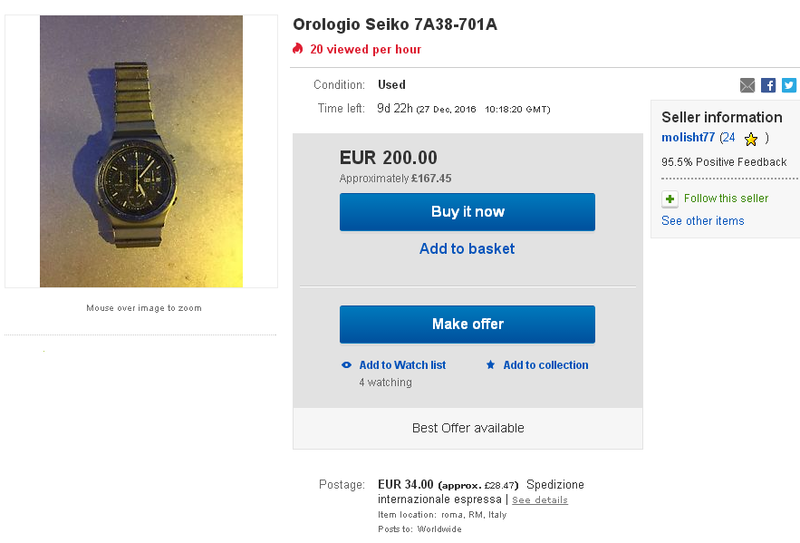 The only real downside is the Italian seller's expensive choice of shipping - DHL Express at a cost of 40 Euros. 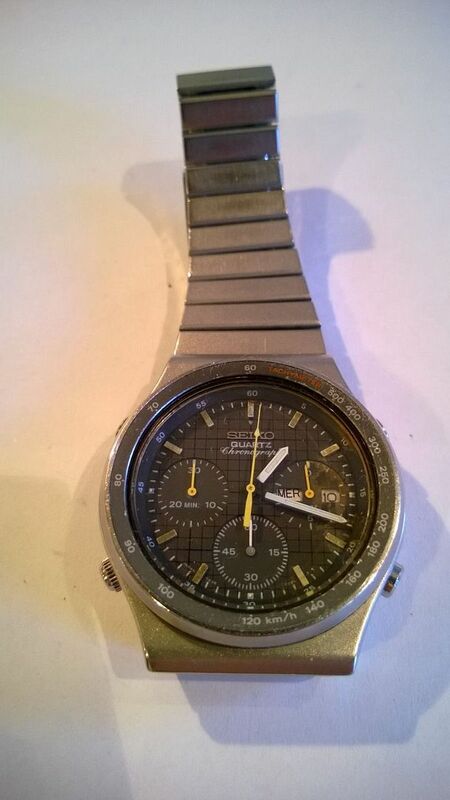 As a comparison, here's another 7A38-701A in not quite such good condition, offered for sale yesterday on the German watch forum, Uhrforum.de with an asking price of 215 Euros. 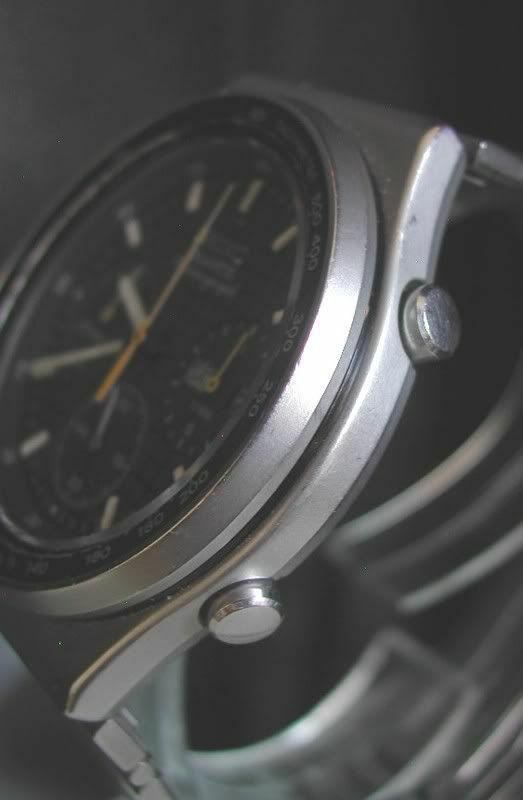 Note the chronograph hands on this example are typically faded to yellow and that the short bracelet has been fitted with a clasp extender. I wonder how the extender works I see a joint and two spring bars. Paul, any ideas ? 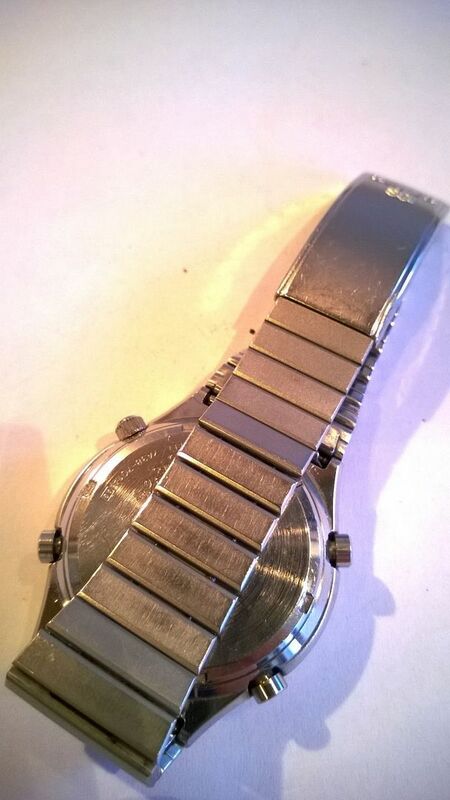 It 'works' by merely adding extra (fixed) length to the SQ clasp, Don. 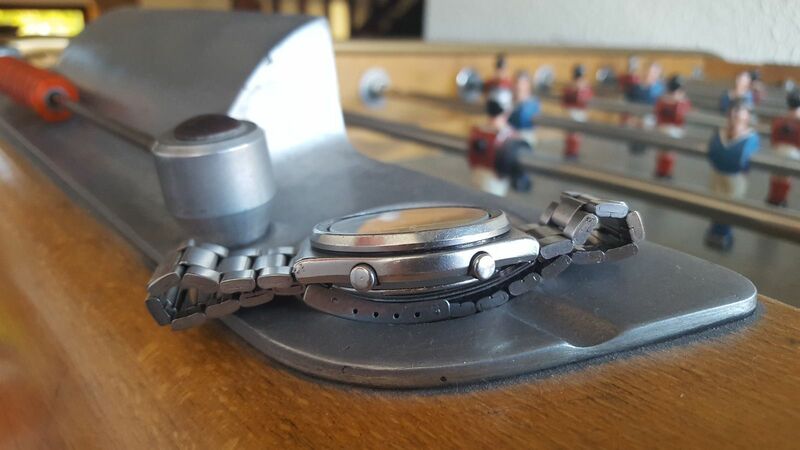 It's not a (spring-loaded) extender as such - more just a simple extension - and a cheap solution to a short bracelet. 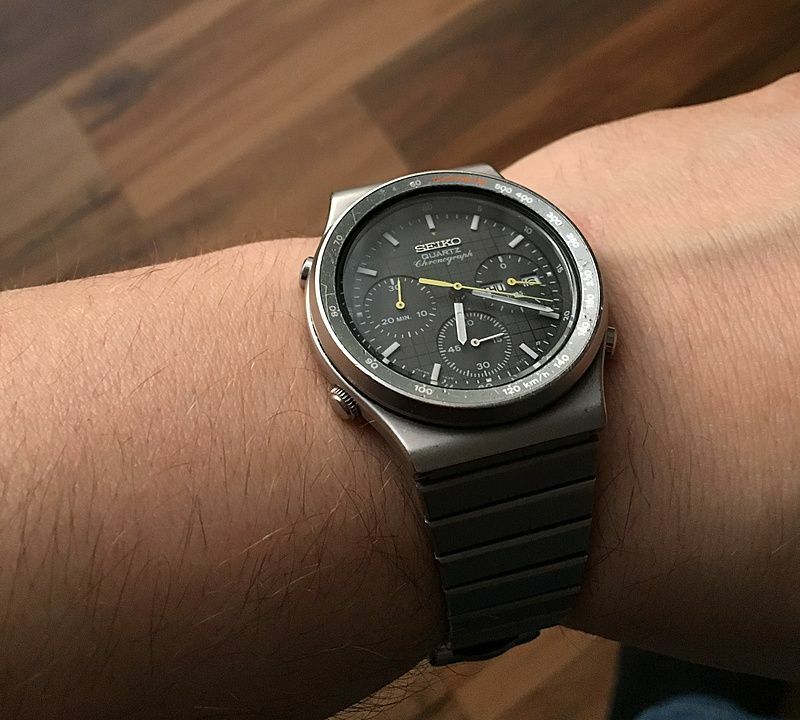 You may remember I used something similar on one of my JDM 7A38-7110's a while back (before I bought another with more links). 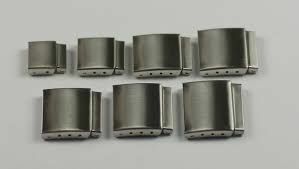 There are a few different stampings out there and the quality can be variable. 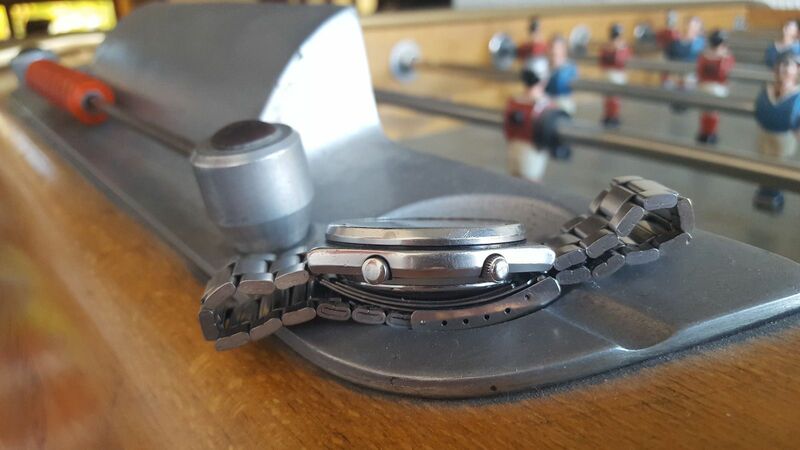 To get the best fit on the clasp you'll sometimes need to elongate the holes slightly (as I had to, to mate it with the 7A38-7110 Speedmaster clasp). 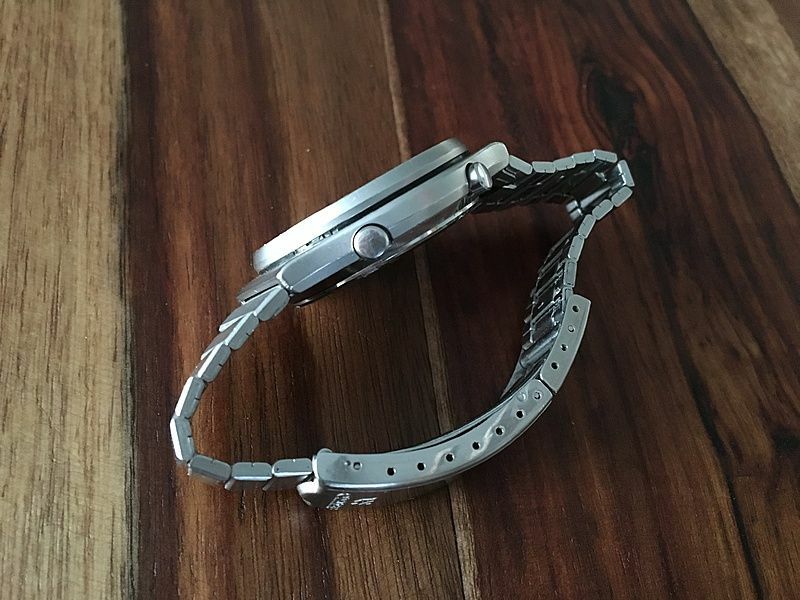 Not the prettiest of solutions, I'll grant you, but probably better than the spring-loaded type (that you use) in situations when a bracelet is short of a few links. 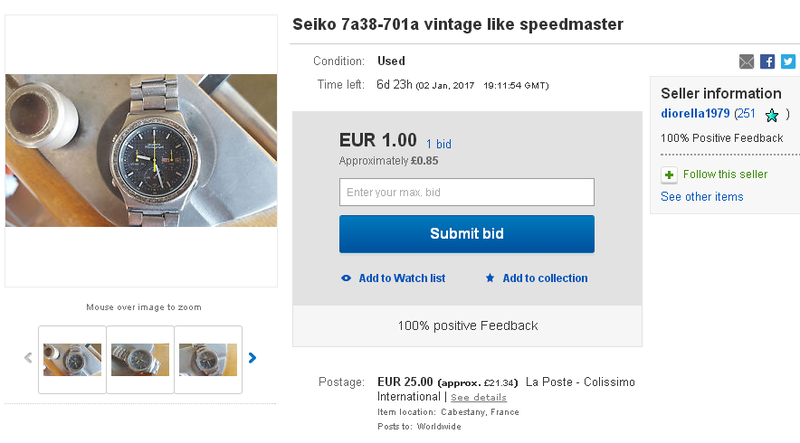 There was clearly a lot of interest in that 7A38-701A; last time I checked, late yesterday afternoon, the listing had over 100 watchers. 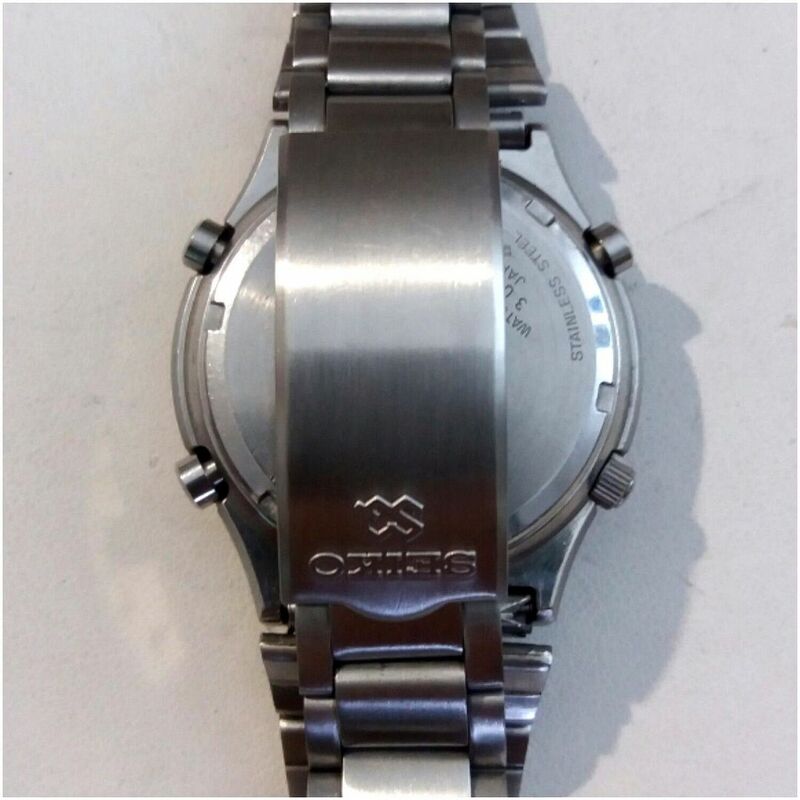 The auction ended yesterday evening, selling for 285.54 Euros after 36 bids (by 19 different bidders). 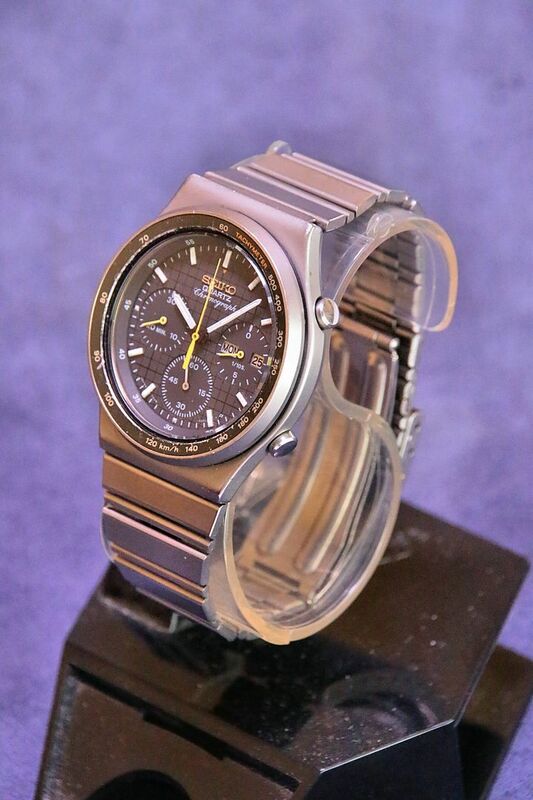 The auction was won by a comparatively new member of this forum. 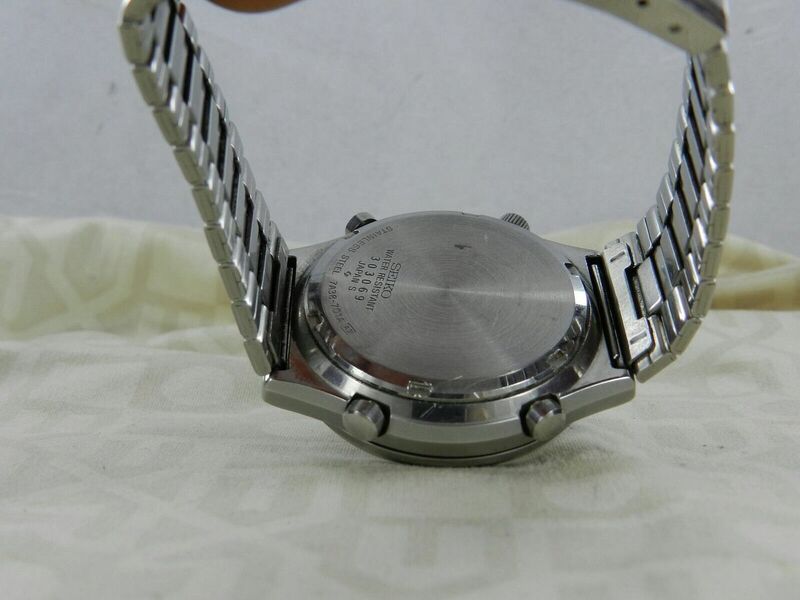 This 7A38-701A fitted with a clasp extender was listed yesterday afternoon by a German eBay seller. 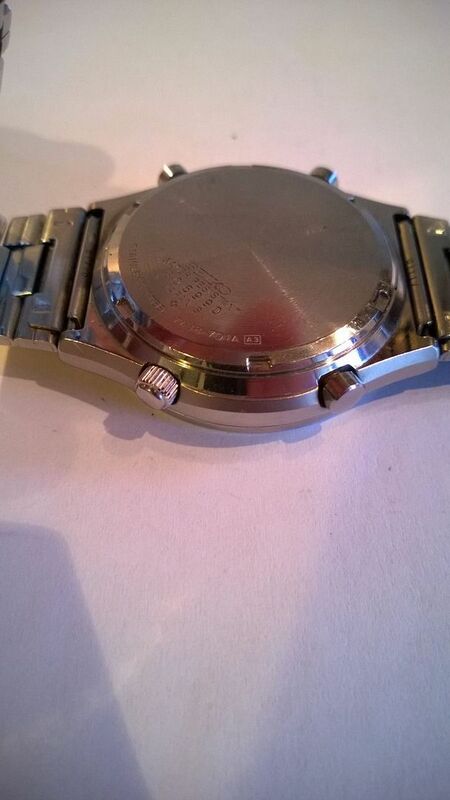 If 'clasp extender' sounds familiar, it's because this is the same 7A38-701A which was offered for sale on UhrForum.de in March - see higher up the page. 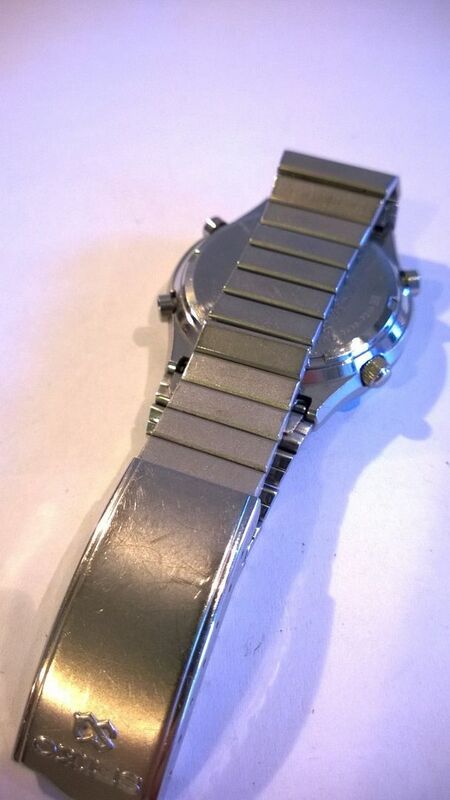 Seltenere Ausführung mit dem wunderschön karierten Ziffernblatt. Diese Stücke werden immer schwieriger zu finden. 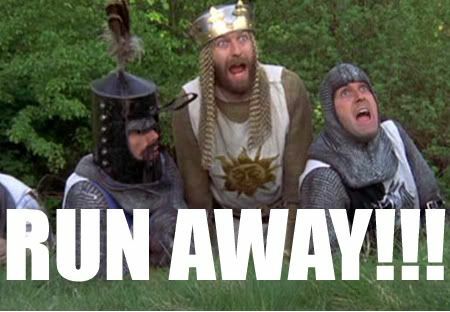 Alle Funktionen erfüllen ihre Dienste wie am ersten Tag. 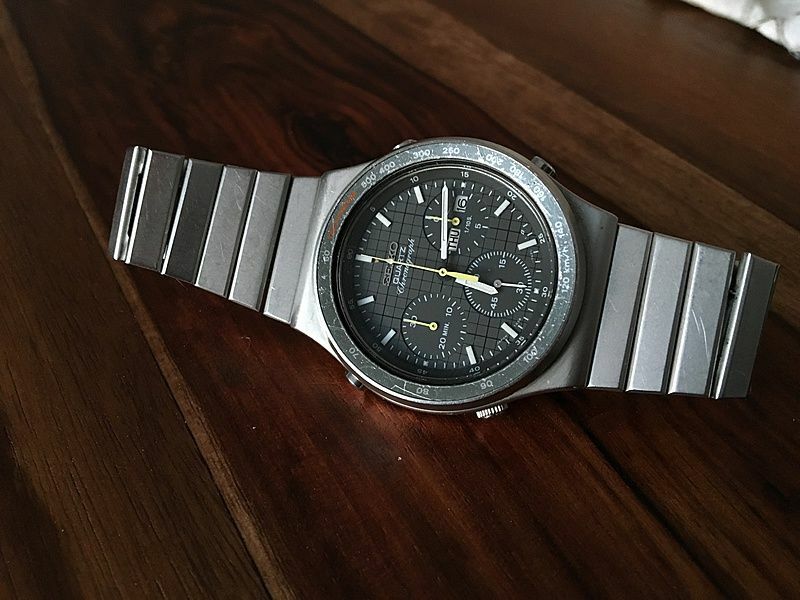 Das die Uhr nach über 30 Jahren einige Spuren vorzuweisen hat ist natürlich klar, dennoch ist der Zustand gut. Das originale Glas hat ein paar Kratzer, was aber nicht direkt auffällt. 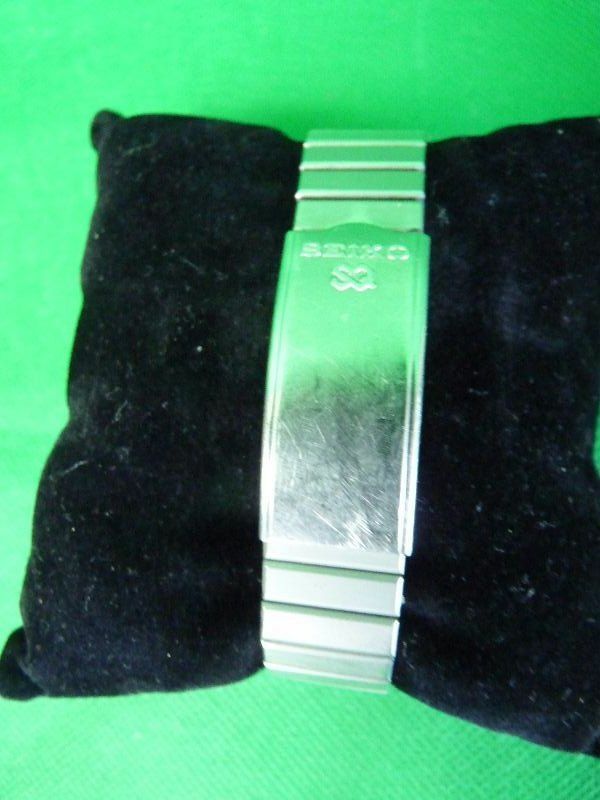 Das Originale Armband reicht bis 20er HGU. 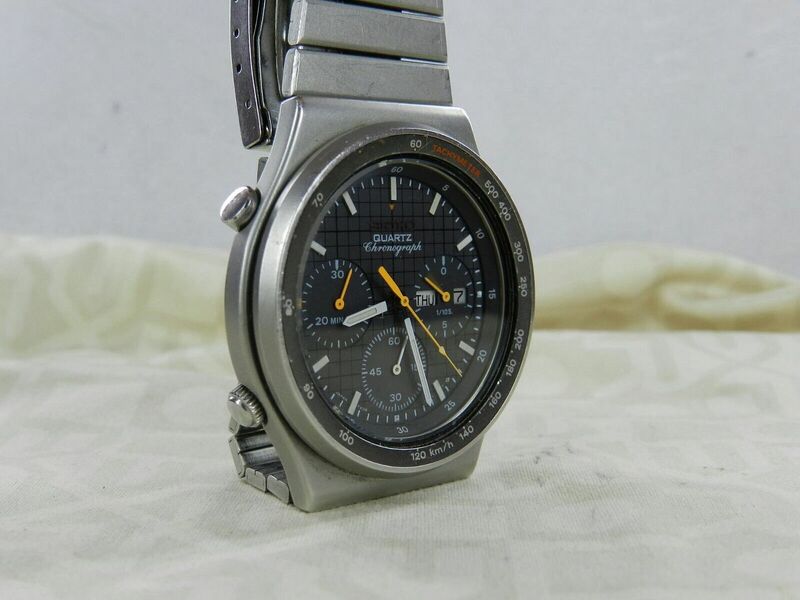 All Functions are working and the overall condition is very good for this age. 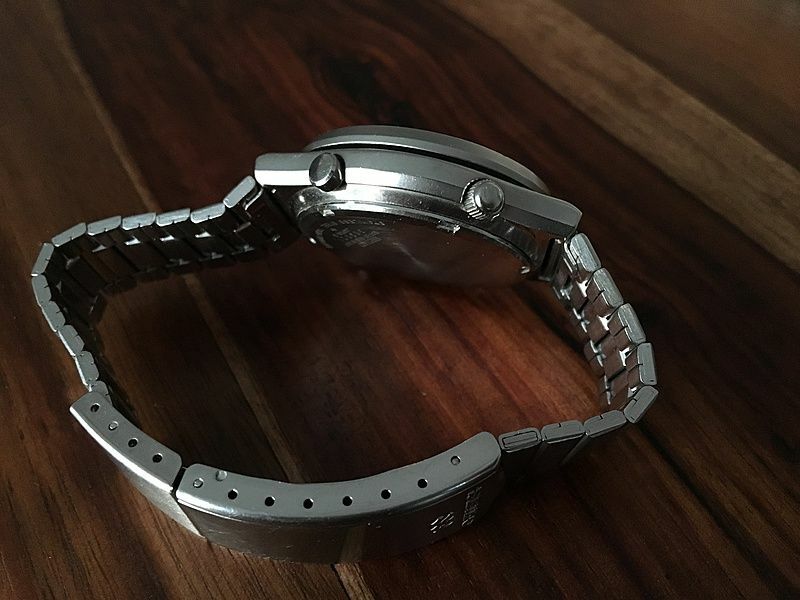 The Watch keeps the time and all buttons works smooth. 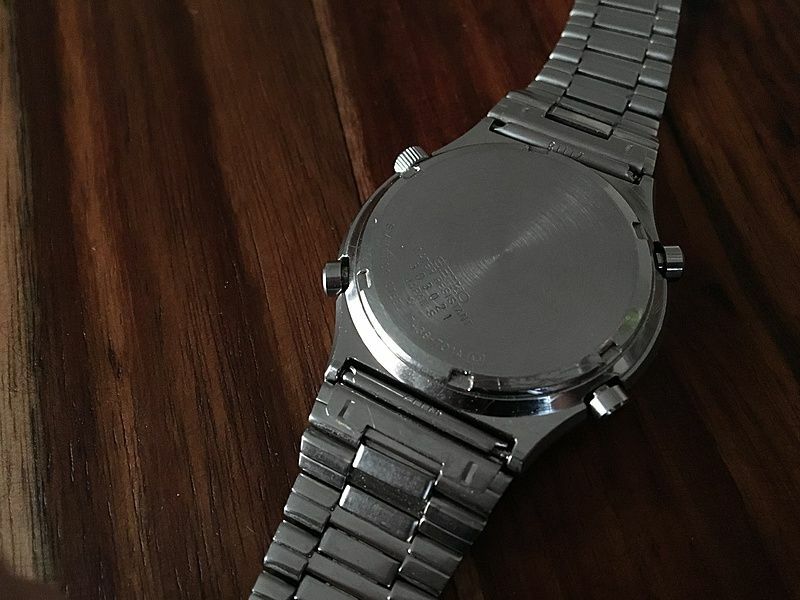 The original glass and the inlay have some small scratches. 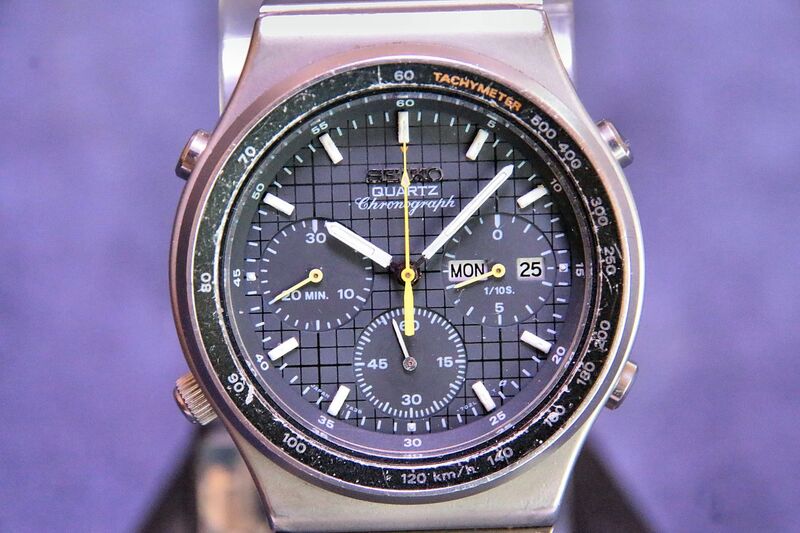 It sold early this morning for the 250 Euros Buy-it-Now asking price. 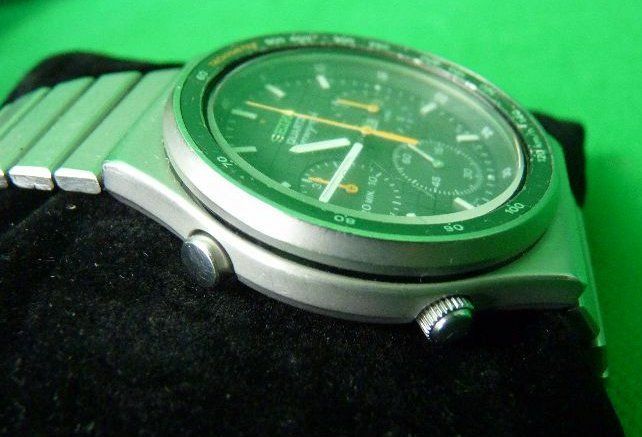 This horrible example of a 7A38-701A was listed yesterday evening by an Italian eBay seller. 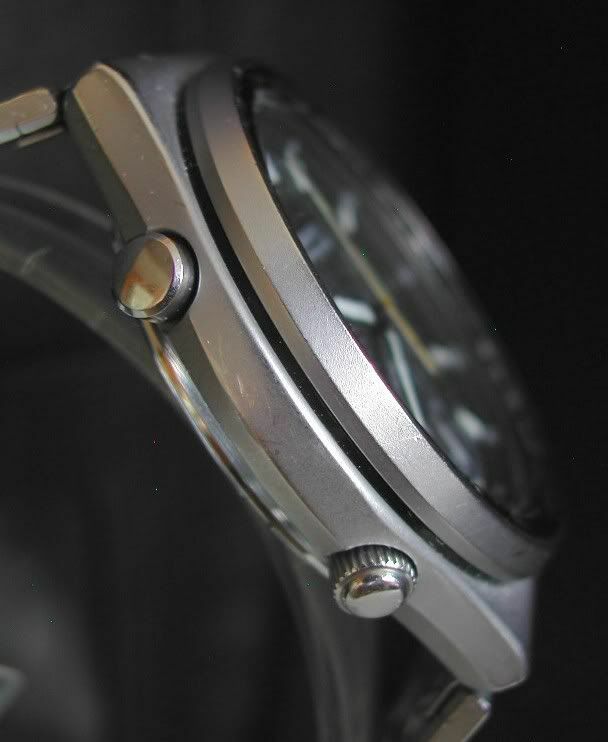 Apart from the non-original bracelet fitted, the dial batons and pips appear to have been re-lumed - badly. 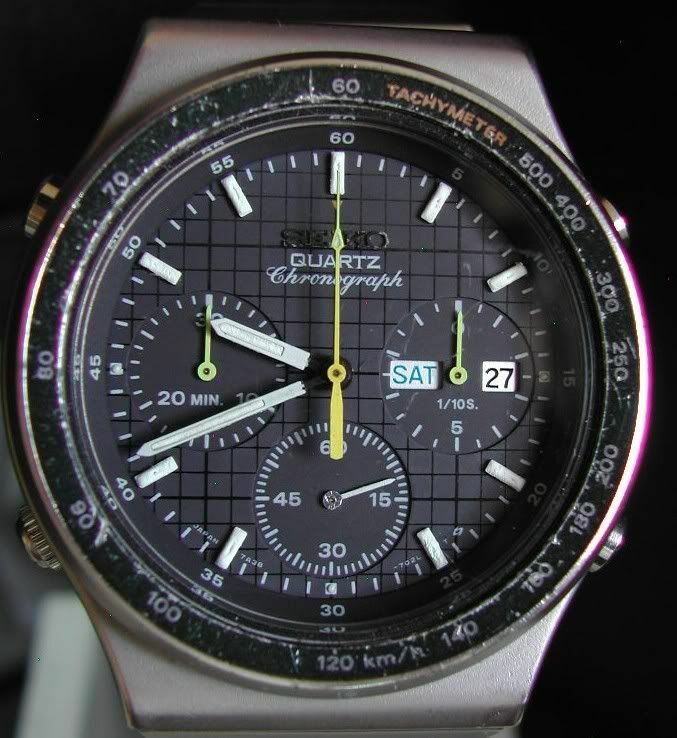 The bezel doesn't appear to be correct for this model either - though given it's battered condition it's kind of academic. 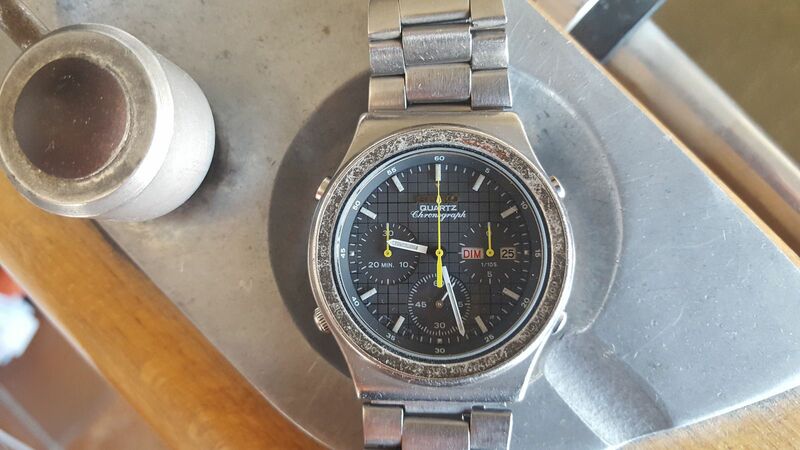 Note the metallic candy red TACHYMETER lettering and black inlay background. It should be metallic orange with a dark grey metallic background. 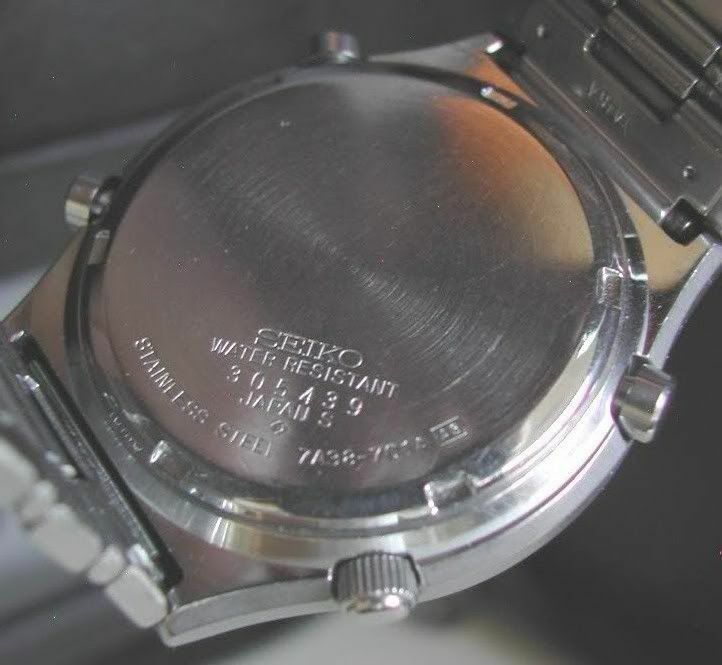 Looks like someone may have fitted the bezel from the sister model 7A38-7010 at some point. 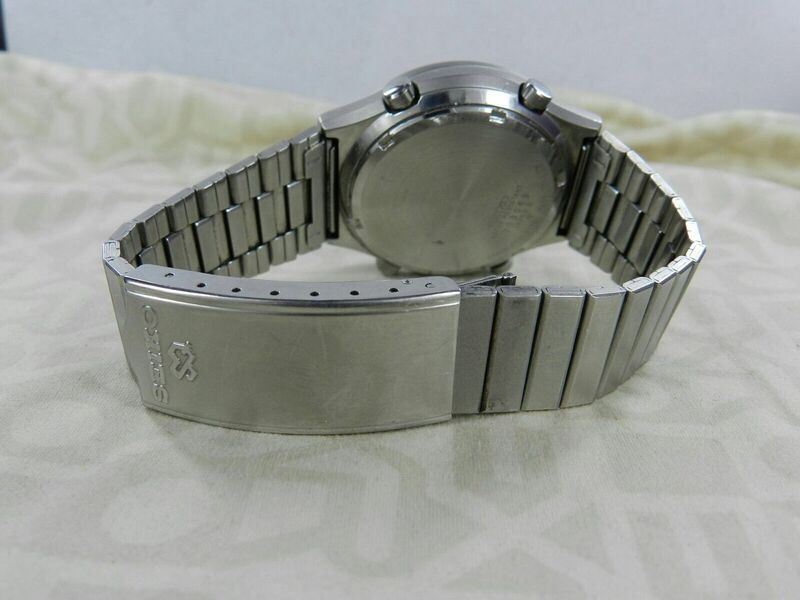 Then again, it may just be an illusion, due to the seller's crappy photos. 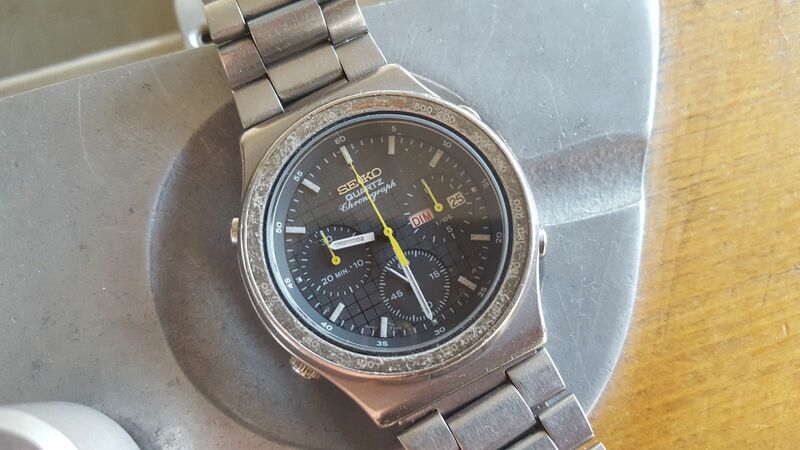 OROLOGIO SEIKO DIVER DIVING CRONOGRAPH AL QUARZO ANNI 90. 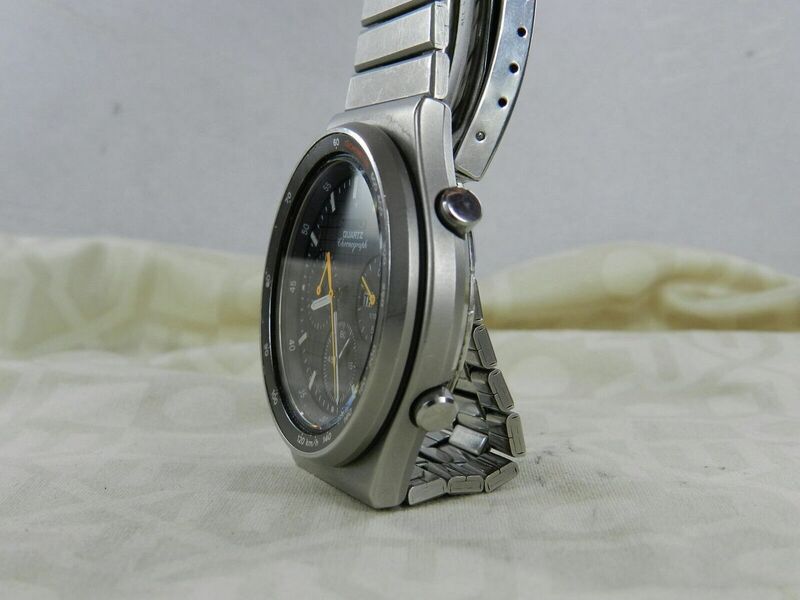 FONDELLO IN ACCIAIO A VITE CON LOGO SEIKO E INCISIONI VARIE. 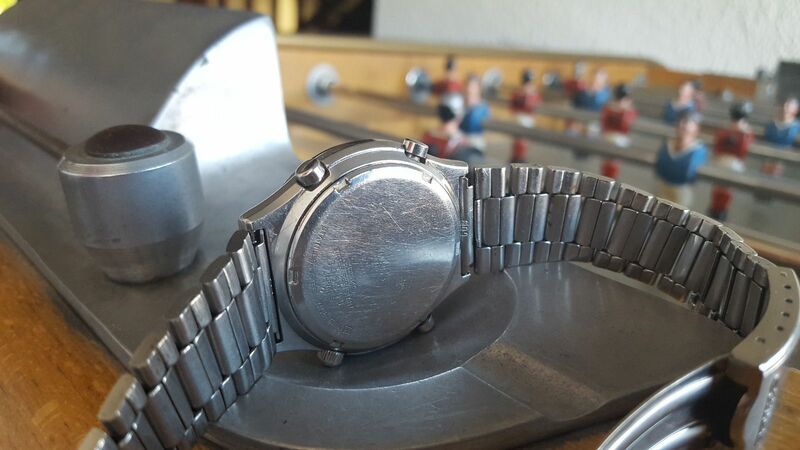 CORONA ZIGRINATA E PULSANTI IN ACCIAIO . 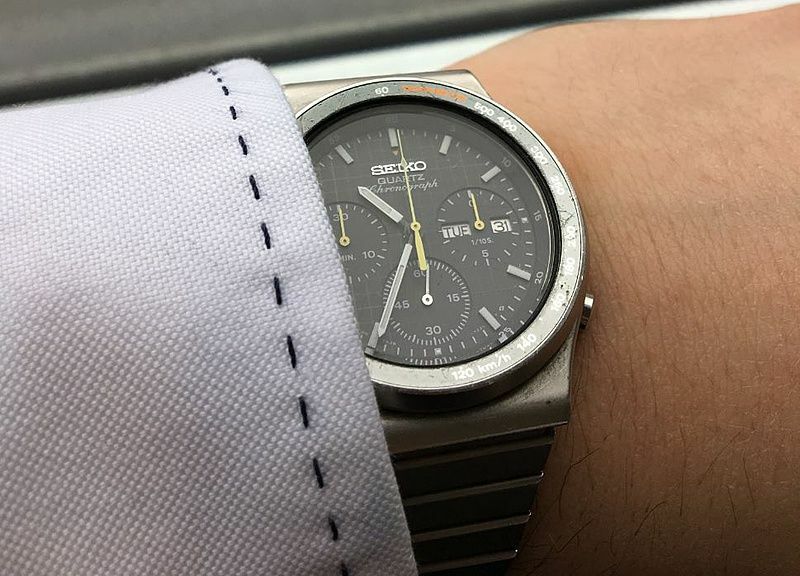 L'OROLOGIO E' SUB MA NON'E' TESTATO, E' IN OTTIME CONDIZIONI GENERALI E' FUNZIONANTE IN TUTTE LE SUE PARTI E TIENE IL TEMPO. 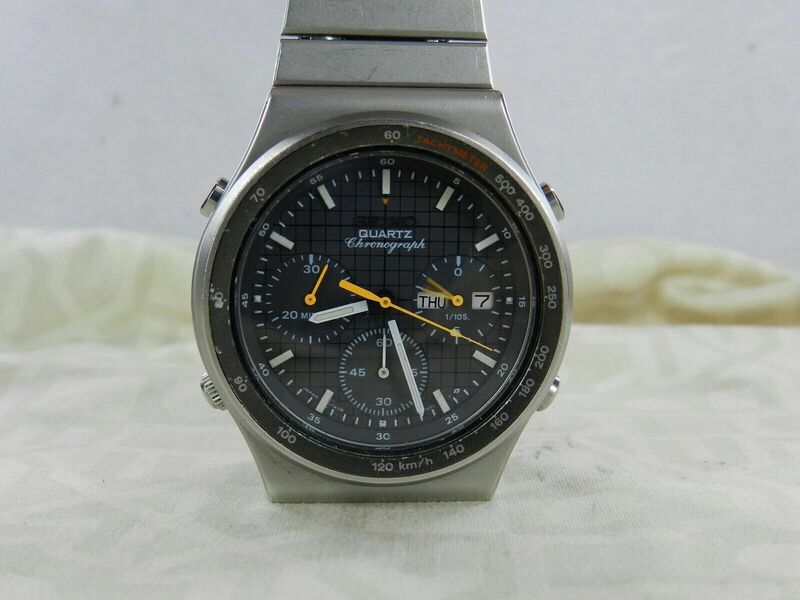 PER GLI ACQUIRENTI CHE SI AGGIUDICANO L'OGGETTO E CHE NON COMPLETANO LA COMPRAVENDITA SARANNO SEGNALATI E AMMONITI DA EBAY. 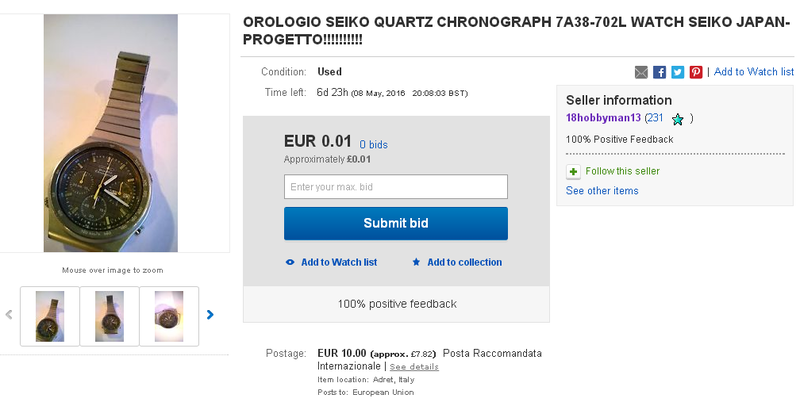 FATE OFFERTE SOLO SE SIETE VERAMENTE INTERESSATI. 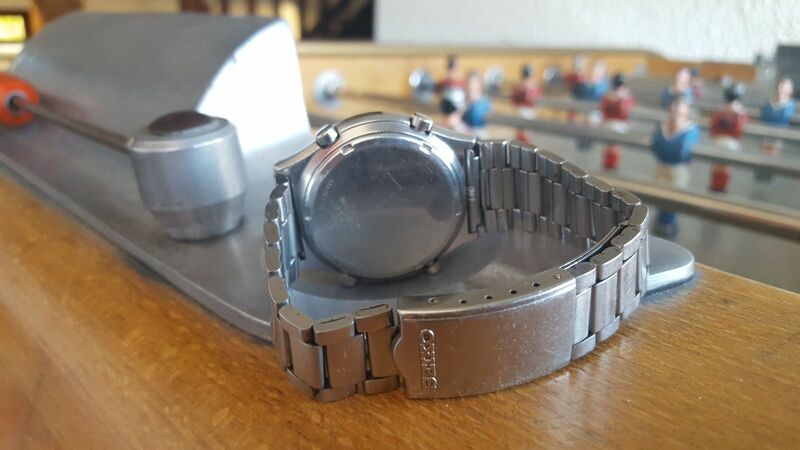 Gli oggetti messi da me in vendita appartengono alla mia collezione privata. il pagamento deve pervenire entro 5 giorni dall'acquisto. 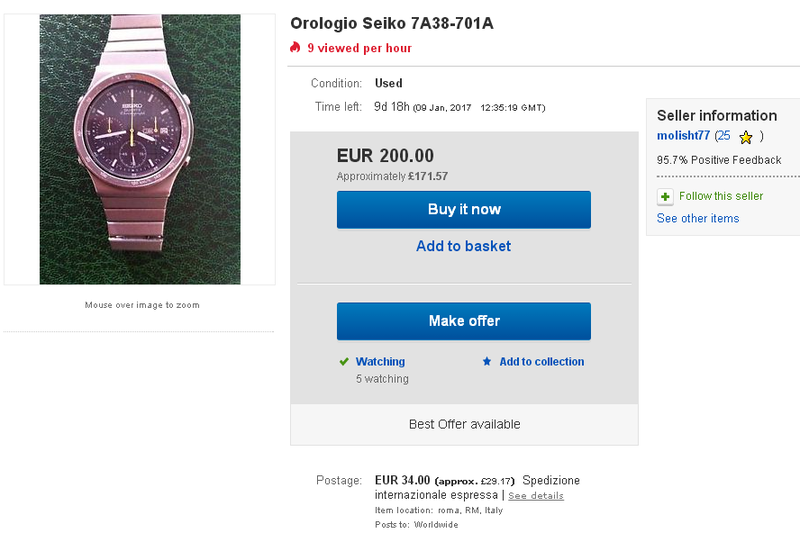 The above Italian eBay auction for a very poor example of a 7A38-701A (fitted with a non original bracelet and more besides) ended a few minutes ago, selling for a sursprisingly high 200 Euros after 11 bids - mostly due to the combined efforts of two last second snipers. 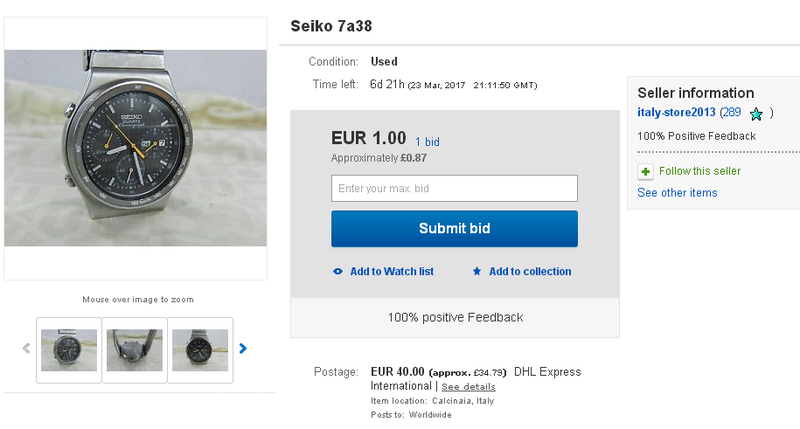 The losing bidder wisely sniped $199 Euros.